Our quest takes us into the past through pathways used by the Ancient Mayans inside the ATM Cave. Here you’ll discover a lost world hidden deep within the jungle. Allow us to unveil the secrets of “Xibalba” the Mayan underworld to you. The crystal maiden is believed to be the sacrificial remains of a teenage girl to the Mayan rain god in a desperate time of drought. First, your Adventure begins at 8:00 AM with a 45 Minutes drive on paved road to a cut-off at Teakettle Village. Followed by a 30 minutes drive on dirt road to the atm cave parking lot. We then venture into a 45 minutes jungle hike along the river bank, crossing the river 3 times – enjoy the scenery. Finally, at the mouth of the atm cave, your guide briefs you on the cave’s historical facts, then we gear up with helmets and head lights. The hike inside the cave entails very short swims & mostly wading through the river. You’re able to admire the myriad cave formations until reaching the hidden dry chamber. 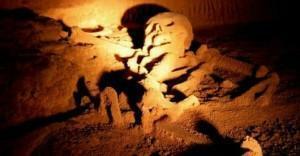 Here your guide explains the Mayan rituals while you awe at the magnificence of this ancient tomb. 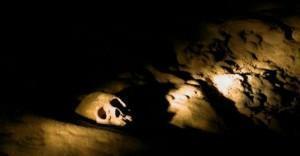 You’ll be amazed how close you can get to an ancient mayan skull at the atm cave. With no rails or borders to keep you from reaching out to them, this is amazingly well-preserved! Subsequently, you’ll climb a ladder into a smaller chamber to witness the intact & crystallized skeletal remains of “The Crystal Maiden”. After being saturated to capacity with astonishment, we make our way back out of the chambers & the cave. Alas, we head back to San Ignacio arriving around 3:30PM – 4:00 PM. What to Bring: Tennis or water shoes, lightweight pants, lightweight shirt, towel, change of clothes, insect repellent. Restrictions: This tour is not for persons with disabilities, heart conditions, back or leg problems. All guests must be in good physical conditions & able to walk in a jungle. The ability to hike for 4+ hours, be comfortable with small spaces is important. Helmets & lights are provided. Non-swimmers are provide with life jackets. No cameras allowed inside the cave. Need a shuttle to/from our Hotel? Ask about our rates to other destinations such as Placencia, Guatemalan Border and others.